Friday off means making time! I love it when I have a day off work to set aside for just ‘me’ stuff; no study or work and I get up whenever I want, do whatever I want, eat what and when I want. Unfortunately they only happen after I’ve worked 11 tiring days in a row. Made even worse this week a horrible flu-slash-cold. The flu bit has passed but left me energy-less and a snot monster! Poor me. But back to my Friday. After the free motion embroidery class at Fabric HQ’s new head quarters last week, I had a fabric picture to finish and several more ideas to put into motion. 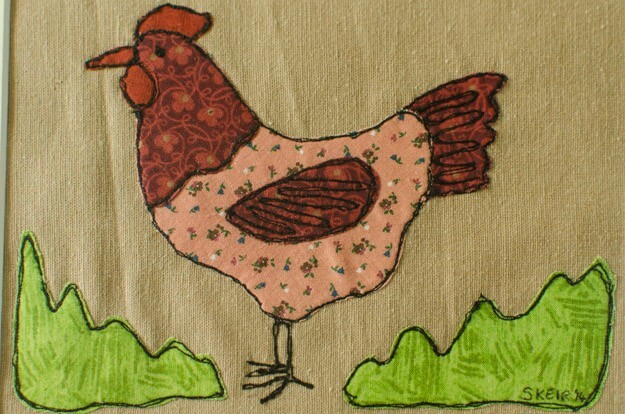 I made the chicken picture at the class and was toying up whether to add more embroidery to it but decided that less is more in this case and left it alone, just mounted it and then found I had no suitably sized frame. So that started a Friday morning shopping trip when I realised I would also need supplies for the next few projects; The Plainstitch in Wendover, Chilterns brewery for supplies for Jim, Fabric HQ (and a peek next door at Obsidian Art for inspiration) and Hobbycraft in Aylesbury. So here is the finished chicken. I am quietly satisfied with my first piece of free motion embroidery. I am toying with the idea of doing my three hens in a triple aperture frame and I would try to inject some of their individual personalities into the pictures. 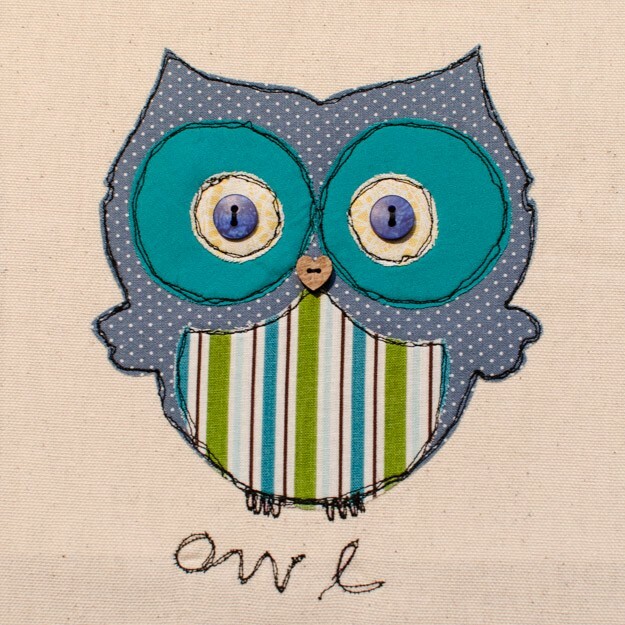 I started this owl at the class but ran out of time to complete it. I definitely need more practice with the wording; it is very rustic looking! But I love the heart shaped button beak that I found in my button box. I am really excited about this medium as feels so free and impressionistic. Or perhaps that is just because I have changed myself, away from the perfectionist child that wasn’t happy with anything I produced to a more mature and relaxed adult. I don’t know the answer to that because my photography is still perfection driven but this combination of sketching with a machine and lovely bits of fabrics and the addition of anything else has really captured me. I am so entirely entralled that I have started on an ambitious project to make a fabric picture of our house. I hope to finish it before Christmas – I’ll let you know how I get on! 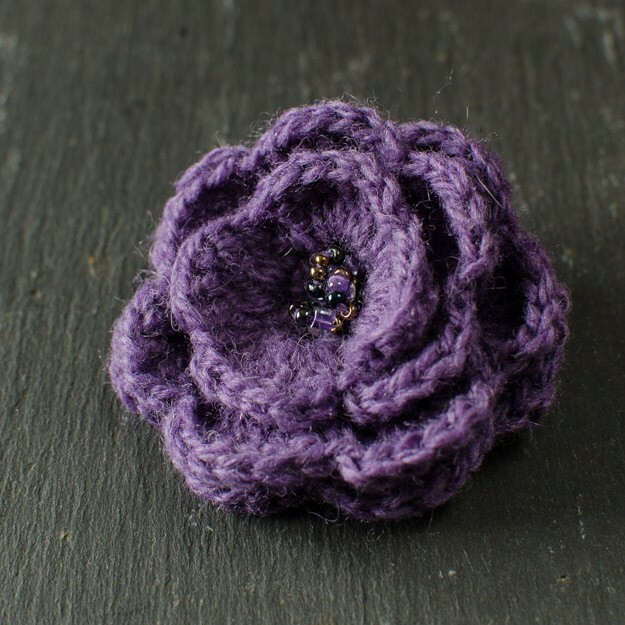 I also finished the crochet flower brooch that I started on our weeks holiday in Suffolk. Here it is, ready to wear, perhaps on my tweed jacket if the rain holds off long enough!